At TrizCom PR, we’re fortunate enough to work with some very interesting clients, one of which is Unequal Technologies. They’re a Philadelphia-based manufacturer of protective gear designed for sports and military use. Their products include the Halo 3 head band, proven to reduce concussions in youth soccer by 56 percent, and more recent items like bulletproof shield inserts for school backpacks and police vests. Well, we live in Texas, so you can only imagine that the bulletproof products caught the attention of several school districts and sheriff’s associations in our state. 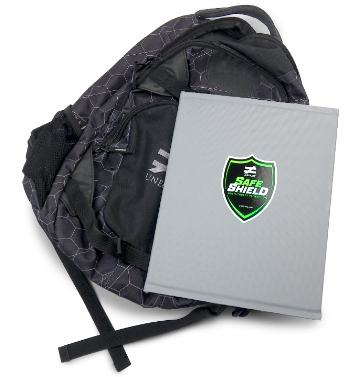 Two products, the SafeShield (for backpacks) and the SapiShield (for bulletproof vests), became the centerpiece for a hastily scheduled news conference at the Texas State Capitol in Austin Oct. 17. The happenings of that day would prove a vital point for public relations people—the importance of being there. Ahead of the news conference, media alerts were sent to all applicable Austin-based press outlets and bureaus. The appointed time was 11 a.m.—we had booked the media room belonging to the Texas Speaker of the House. My 6 a.m. flight on Southwest Airlines left the runway in darkness, and I had but one thought as I stared out the window at the daily gridlock of Dallas traffic below. Would anyone even show up for this news conference? I arrived at the State Capitol Building at 9 a.m. on an overcast and dreary day. Ten minutes later, I would receive a text on my phone from a number I did not recognize. It was the local Austin NBC affiliate, asking if we would have samples of the bulletproof inserts available at the news conference. And just like that—we were off to the races. We began unpacking suitcases full of the samples, placing them strategically at the podium of the room. Literature was distributed. Mannequins were dressed in bulletproof vests. It looked like a retail store by the time we finished. More media responded that they were on their way. Things were looking good for what I hoped would be an avalanche of coverage. I was afraid he could literally hear the record scratch sound go off in my mind. I quickly devised an alternate plan to remove all of the products from the front of the room to a corner, where the media would be allowed to sample them after the speaking portion finished and the interviews began. As the presser got started, we had three out of four local networks, and two statewide newspaper bureaus in the audience. The speakers did an excellent job and the media pushed back with thought-provoking questions. The presser then broke out into one-on-one sessions. Before it was all over, one of the reporters gave a live report while wearing one of the vests. I got a call in the middle of this from a radio station back in Dallas, asking for audio. “If you can get soundbites to me in the next 30 minutes, I’ll blast it out to 132 affiliate stations across Texas this afternoon,” he teased. Done and done. By the time I got back on the plane to head back to Dallas later that afternoon, I was exhausted and exhilarated at the same time—a rare feeling. We had pulled it off after all, a news conference with a lot riding on it. It took some fancy footwork at several different junctures to adjust to the challenges we faced. I think one thing made all the difference in the world. At TrizCom PR, that’s just what we do for our clients.